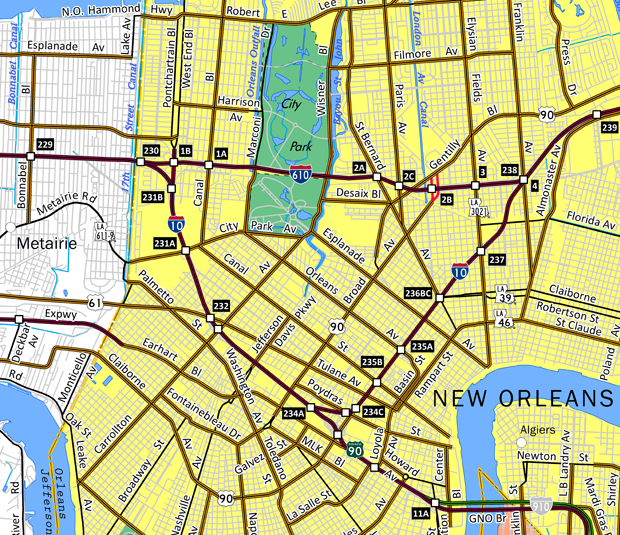 Interstate 610 follows a linear course to the north of the I-10 dog leg to Mid-City, Downtown and the French Quarter in New Orleans. 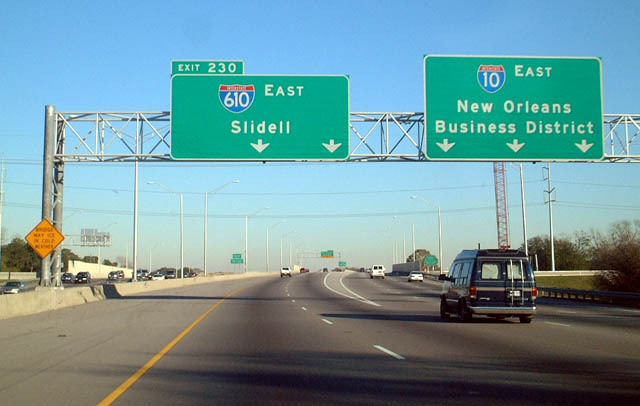 Interstate 610 constitutes a crosstown route for through traffic along I-10 in central New Orleans. The six lane freeway extends east from I-10 between the Lakeview and Navarre neighborhoods. 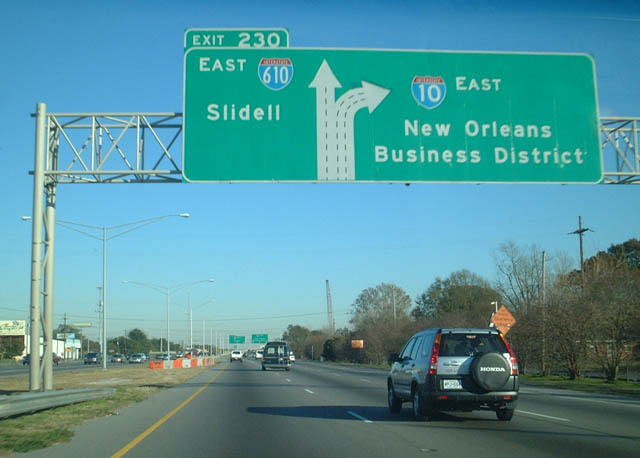 Passing through City Park, I-610 continues by the the Fairgrounds and Dillard University to merge with I-10 by the Gentilly Terrace neighborhood. Interstate 610 runs along a viaduct system between the St. Roch and Gentilly Terrace communities east to the wye interchange with I-10. Exit 3 joins the freeway with Elysian Fields Avenue, LA 3121 north to U.S. 90 (Gentilly Boulevard) and south to Claiborne Avenue (LA 39). Photo taken 05/09/15. Exit 4 lowers from Interstate 610 to Franklin Avenue. A two lane flyover follows onto I-10 east ahead of Louisa Street and the High Rise bridge. The LADOTD geographic features file references the east end point for I-610 at Franklin Avenuee. Photo taken 05/09/15. I-10 curves southward from Gentilly Woods onto a viaduct leading to the wye interchange 9Exit 238B) with Interstate 610 west. Photo taken 05/09/15. A half diamond interchange (Exit 238A) joins Interstate 10 west with Franklin Avenue ahead of the split with I-610. Ramps connect Franklin Avenue with I-610 west and from I-610 east as well. Photo taken 05/09/15. Interstate 10 continues southwest to the French Quarter and the New Orleans Central Business District as I-610 beelines westward to City Park, Lakeview and I-10 at Metairie. Photo taken 05/09/15. 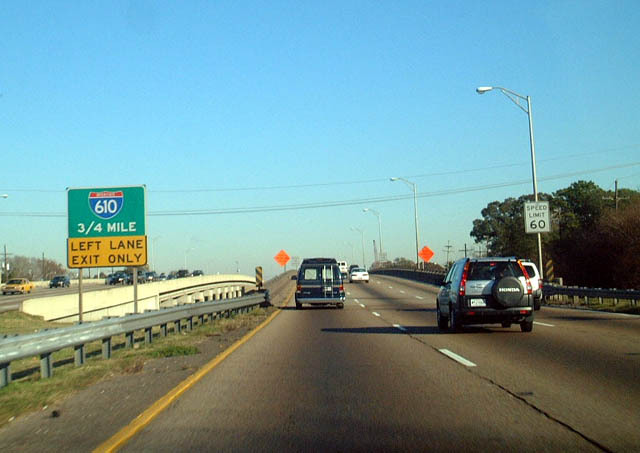 Interstate 610 east approaching I-10 in 2002. 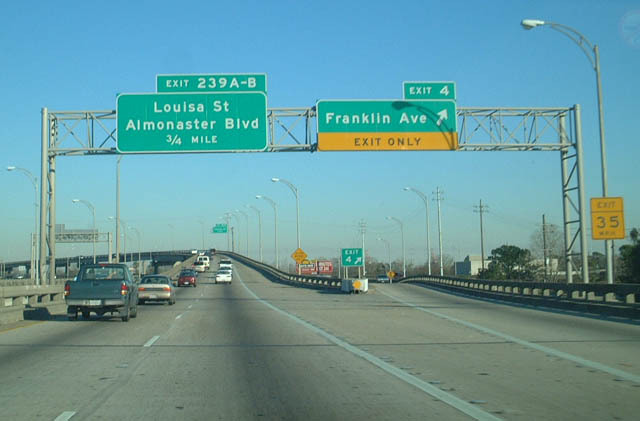 Exit 1A departs I-610 west for Canal Boulevard to the Lakeview and Navarre neighborhoods. A three quarter cloverleaf interchange (Exit 1B) follows with Pontchartrain Boulevard south to I-10 east. Photo taken 05/09/15. Pontchartrain Boulevard connects I-610 west with I-10 east to Mid-City and Downtown at an adjacent wye interchange via Exit 1B. Photo taken 05/09/15. Interstate 610 west passes under West End and Pontchartrain Boulevards ahead of the merge with I-10 at 17th Street Canal. Interstate 10 continues west across Metairie and Jefferson Parish. Photo taken 05/09/15. The first guide sign for Interstate 610 appears at the collector distributor roadway (Exit 228) for Causeway and Bonnabel Boulevards. A $100-million project upgraded the congested cloverleaf interchange here between April 2009 and summer 2012. Photo taken 04/20/12. 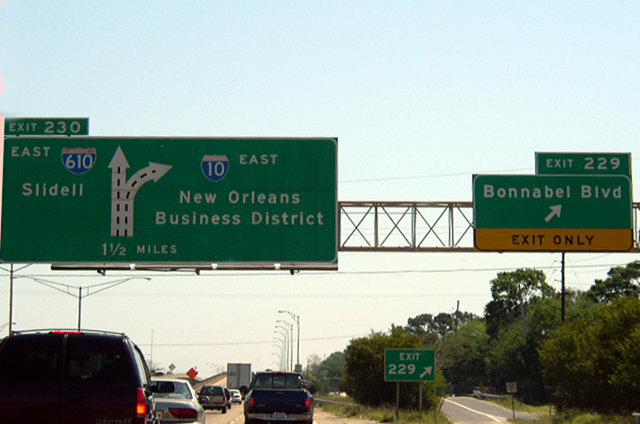 Passing over Bonnabel Boulevard, Interstate 10 carries ten overall lanes between Causeway Boulevard and the 17th Street Canal. 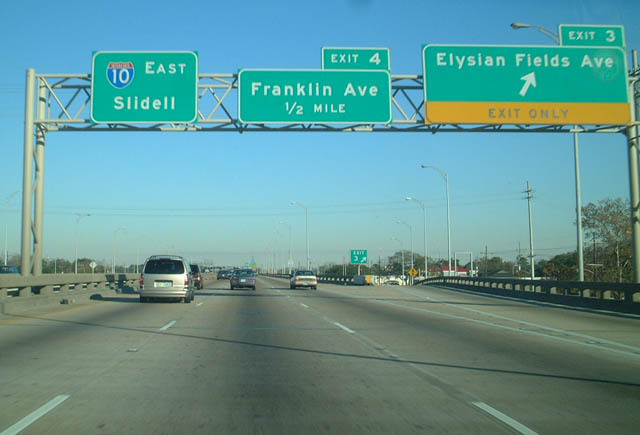 Widening of I-10 east to I-610 through Metairie was completed in 2009. Photo taken 04/20/12. Interstate 610 represents the third in a series of end points along I-10 east over a 30 mile stretch. The previous two were I-310 at Exit 220 and I-55 at Exit 210. Photo taken 04/20/12. Interstate 610 continues due east from Exit 230 to Lakeview and City Park as I-10 turns southeast along the Pontchartrain Expressway to the Central Business District and the Crescent City Connection bridge (U.S. 90 Business) to the Westbank. Photo taken 04/20/12. 2002 and 2003 photos showing the previous lane configuration for I-10 east at I-610 through Metairie. “I-10 Roadwork Pops the Cork on Bottleneck – $27 Million Project Buys Time for Drivers.” The Times-Picayune (New Orleans, LA), June 13, 2000. Interstate 610 (Louisiana) @ Wikipedia.org.